Twas my own heart, dilly, dilly, that told me so. When I am queen, dilly, dilly, You’ll be my king. It’s a pretty flower, but does self-seed outrageously, I just pull handfulls out when it get’s a bit too much ! damn and blast!! One man’s weed is another woman’s flower 🙂 It’s all in the definition! How lovely, will be haumming that all day. Didn´t know all the verses….and those photos are so beautiful. Mother Nature does create the most amazing colours doesn´t she?! No I didn’t know the verses either, just the main refrain. and yes nature does give us a feast for the eyes! I used to hang with the artist Salvatore Dali’s brother, Dilly Dali. I’ve been growing Love in the Mist for years. The first year, Mr Misk wanted to pull it up because he said it was a “weed” — I’ve managed to incorporate wild cornflowers into the border this year, too. Lots of blues! I haven’t got any cornflowers this year, such a shame, but I did pick up a packet when I visited Charleston the other week. The mix of blues sounds “dreamy”. I’ve discovered Cathy’s blog today, from a link on yours – gorgeous! A lovely idea for Angel, do you have sunflowers too ? Oops sorry to remind you of your loss! 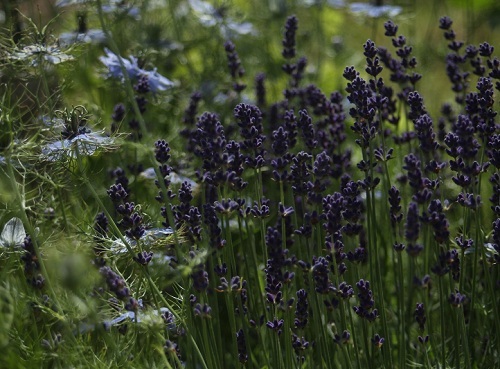 The lavender in my garden is taking ages to flower – it was planted in the garden before we bought the house and they must be a different variety because your flowers are a much darker hue than ours. Noodle I have a few different lavenders on my plot, this one is earlier than the others, but everything is late this year!! Had an ok day – a quiet day in recovery after a very hectic weekend! Hi there! So you have Nigella among your lavender too! I find the mix of blues and the flower shapes is lovely. I would love this, except my own lavender is MIA this year. Sigh…it is a lovely ditty though. I lost a couple of lavenders this year too, and the French lavenders never seem to last very long either. Sigh….. too! what lovely dreamy photos Claire and thanks for the sweet ditty to start the day! What a sweet rhyme! I had not heard it before. A perfect accompaniment to your lovely photos! Thank you! It’s been recorded many times, and to be honest Cindy I only really knew the main line – “Lavender Blue Dilly dilly” and for some reason it popped into my head this morning and before I knew it I’d written this post 🙂 And thank you for the compliments ! I’ve seen some wonderful recipes with lavender, I really should get round to trying a few out and Sawsan made that delicious looking salad the other day – so clever and simple! Me, too, to the shortbread idea, Claire…lemon and lavender. I tried Sawsan’s dressing and a variation on her salad, and it was absolutely awesome! Thank you Teresa, I’m sure you would make something delightful and delicious with it! Beautiful photos as always…and that was a favorite song of our kids when they were younger..sigh…nice memory. A lovely memory to have, happy to have brought that one back ! I just cleared some space between some roses this morning and was considering putting some lavender in one of the “holes”. Well, you’ve convinced me! Great photos, Claire. Oh lavender and roses would be a gorgeous combination John, and very happy to inspire! Thank you Nia, lovely to remind you of happy days here! Well it sound slike the day improved, so it’s a pleasure to help 🙂 I bet you could create something of so tasty and beautiful with it! Oh, you clever girl…I love this! I have lots of lavender blues in my garden right now. Claire. if only contemporary poetry was as full of love and nostalgia, I might read more. Thank you for the delightful post. 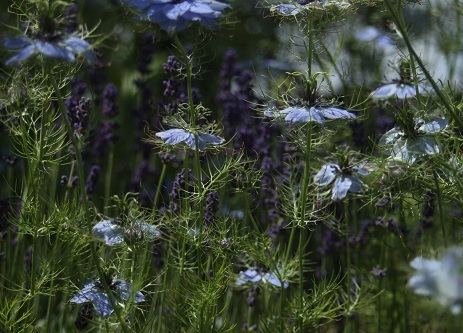 I love Nigella, would love to have it here, but it likes more sun than we have. I have never seen so many verses to “Lavender’s Blue” before.